Is it Spring where you are? We’ve been having almost summer-like temperatures here in Vancouver lately. My Wisteria is in full bloom, my Lilac tree has already bloomed and died off (they never last long enough, do they? ), and the garden centres are doing a booming business! This week’s challenge with the Paper Craft Crew is perfect for this time of year – it’s a FLOWER theme challenge! I pulled out a set I haven’t used in a while, but thankfully it isn’t retiring – it’s Butterfly Basics, from the Annual catalogue. I wanted a taller card, to accommodate my bouquet, so I cut my Old Olive card base at 4 1/4″ x 11″, and scored it at 5 1/2″. I then added a panel of Daffodil Delight cardstock, measuring 4″ x 5 1/4″, then set it aside. I took the large flower image stamp from Butterfly Basics and used my Stampin’ Write Markers in Old Olive and Watermelon Wonder to ink it up, then stamped it directly onto my 3 3/4″ x 5″ Whisper White cardstock. I repeated this twice, then inked up the fern image and stamped it twice in Old Olive ink. 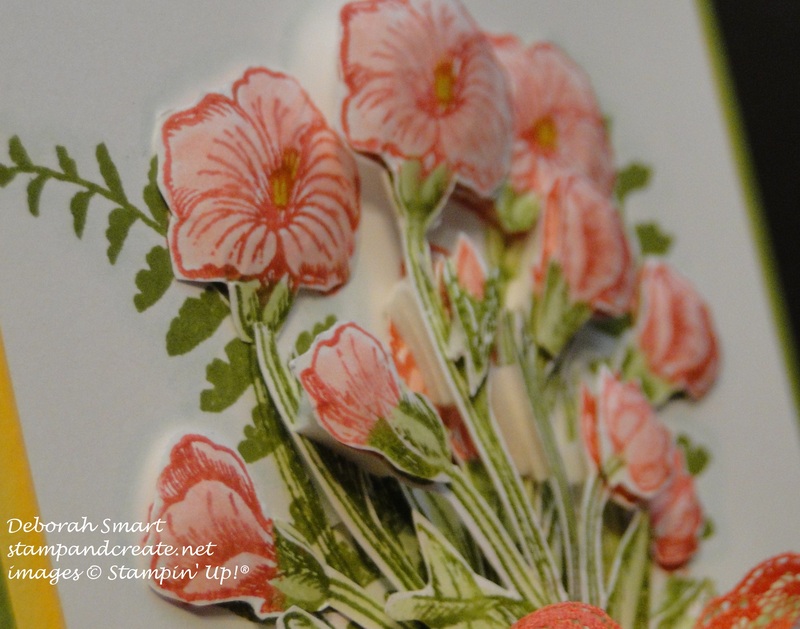 I then stamped the flower image 3 more times on scrap white cardstock, to use for layering. I coloured all of the flowers using the Blender Pen and Watermelon Wonder ink pad, and the leaves were coloured using the Pear Pizzazz ink pad and Blender Pen. The center of the flowers is coloured in using the So Saffron marker. I did this for the stamped images, as well as the extras. I then used my Paper Snips to hand cut all of the flowers and leaves from the scrap cardstock, and layered them on top of the stamped images on my panel, using Stampin’ Dimensionals. I then cut a piece of Burlap Ribbon, and wrapped it around the flower stems. 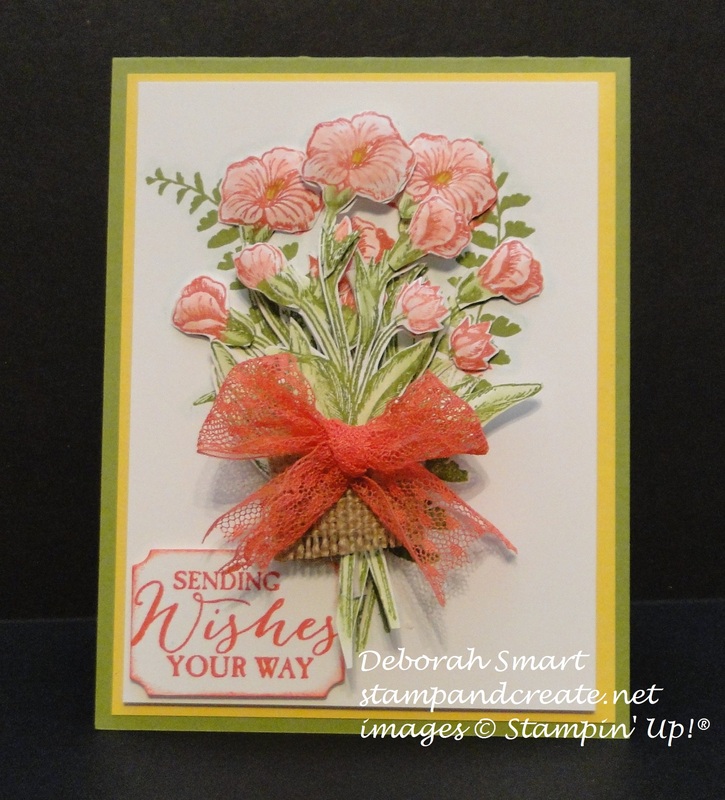 I attached it to the card panel using Tear & Tape, then added a small bow made from the 1″ Dotted Lace Trim in Watermelon Wonder. The sentiment is also from the Butterfly Basics set, stamped in Watermelon Wonder onto Whisper White cardstock, and die cut using the Big Shot and Tags & Labels Framelits Dies. I attached the sentiment and the image panel using Stampin’ Dimensionals. I think it looks pretty spring-y, and it’s definitely flower themed! I think it looks like paper toile. I do hope you like it, and have found some inspiration for your own card. If you have time, I’d love to read any comment that you’d care to leave. Now, please head over to the Paper Craft Crew page to see the other wonderful creations from the rest of the Design Team, and then I’ll be looking for your card to be linked up for the challenge! (by the way – you rocked last week’s challenge!! it was so difficult to narrow it down to only 3 top picks, but it sure was fun visiting everyone’s blogs, and leaving comments). Next Next post: Happy Birthday to Shannon West! Gorgeous creation Deb. Thank you for sharing all the details. Feels like we just had our own private class. Or looked over your shoulder as you created this fabulous piece. 🙂 I can see this in a shadow box. The perfect preserved bouquet. Wow! This is a gorgeous card! Thanks, Susan! 🙂 So glad you liked my ‘faux paper toile’ attempt. Your card is beautiful and I truly enjoyed your humor!! !